Stuff I love that doesn’t fit in the other categories. 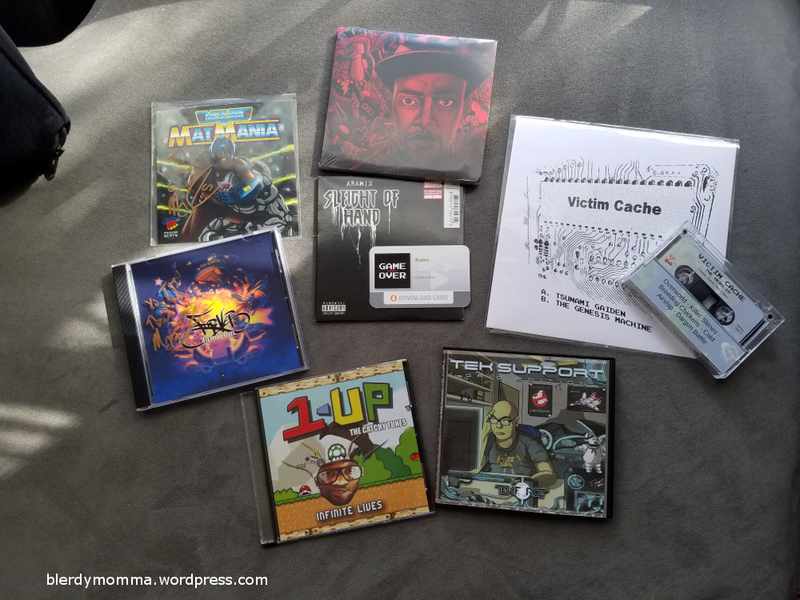 I could’ve just named this post “Classic Game Fest: Music Haul”, but this title sounded more fun. One of My favorite things about Classic Game Fest is the fact that there are musical acts on the sound stage all day long. With the convention being hosted all in one large room, this means I get to blerd out to a soundtrack. As a musician, I love the moments when everyone hears a familiar game tune and there’s just a collective, nostalgic happiness. For the record, I don’t consider the term “nerdcore” to be limited to hip-hop style, but that’s just my interpretation. At Classic Game Fest, we got to meet and listen to a great line up of artists. We made it a point to support our favorites by visiting their booths and buying their music. All of them were super cool and down to earth. We’re all nerds, after all! If you are looking for something new to listen to when you get tired of *insert craptastic pop song here*, check these guys out. Bitforce– This rock trio always puts on a high energy show. This was my second or third time seeing them live and they have a great sound. Aramis– Game Fest was my first encounter with this rapper, but he was absolutely hilarious and chill. Check out his song “RageQuit” on the Sleight of Hand album. 1-UP Creative Mindframe– This guy (real name: Emmanuel) was pretty cool and we talked to him at length about music. He had a little listening station set up at his booth which DJ008 enjoyed and it turns out he plays saxophone too. We picked up a cd after his set. Doug Funnie– We missed part of his set, but his song about Psycho Mantis was what stuck with me most. I’ve spent many hours watching DJ008 play through most of the Metal Gear Solid series. Megaran– So the coolest thing we saw happen on the sound stage was when Megaran did a freestyle using random fan-presented objects for his lyrical inspiration. If you only have 10 minutes, listen to “Infinite Lives” and “Cry of the Planet”. They’re definitely my favorites. Honorable mention: Victim Cache– Ok. I don’t think we actually saw this band’s performance. But their booth was along with all the other artists and what caught my attention was the tapes stacked on their table. As in those things that music came on after 8-tracks but before CDs. Yes. They had them. And they had adorable cover art on them. They also had EPs (the little LPs)! Fret not, they include digital downloads so you can still listen to the music like a modern human being. But Victim Cache gets an honorable mention just for being creative, and I will at least give these a listen. DJ008 does actually have a set of turntables. So there you have it. We spent a lot of time hanging out in front of the sound stage at Classic Game Fest. And if you saw my post about my Games Haul, you know that we are still within the $200 budget that we set for the weekend. Impressed? I sure was! Now go check out all these amazing artists and tell me your favorite songs! I’ve been going to conventions since 2011, which isn’t long; but being in a major metropolitan area means I still get a pretty awesome rotation of local cons to attend each year. I’ve been to enough to start noticing things I do and don’t like about con vendors. I love my nerd interests, but I hate to see a vendor cut corners thinking they’ll get my money or attention just based on how much I love Mortal Kombat (and that’s a LOT). So let’s talk about what it takes to separate me from my money/time/attention, shall we? Have an online presence!- I can’t believe I have to say this in the age of toddlers owning iPads, but seriously, get a website! A Facebook page! An Etsy shop! An Instagram! Get something!! I go to cons knowing I can’t afford EVERYTHING that I want that weekend, but if you have a means to connect online, I can order something later. If I like your product, I can order again. Why would you not have some sort of online presence in this era? Look up when I approach your booth- I can’t tell you how many times somebody’s work has attracted my attention, and then their lack of interaction sent me right on my way. All I want is a hello. Acknowledge my presence! I don’t need your entire sales pitch right when I walk up but let me know that you’re aware I’m there. I see this problem most in the Artists Alley. Be unique- The fastest way to get me to buy something is to make me believe you’re the only place I can find it. I’m a big fan of finding a good deal, and if you’re selling nerdy t-shirts, I’m going to look around at the 6 other vendors also selling t-shirts and probably not buy from any of you. However, my Mortal Kombat nightlight was definitely a unique item which I had to have right then and there. Be pro level- We are not all crafty people. That is why some of us are willing to pay others for their custom made work. In this age of Pinterest and Youtube tutorials, it is very easy for me to convince myself that I can do most things on my own. Your wares need to look like I can’t do that at home for cheaper. I once saw a vendor selling custom onesies. They were adorable, except the part where they looked like simple cut felt hand-sewn onto the blank onesies. I sew all my own cosplays. I think I could manage a felt applique on a onesie. Impress me, please. 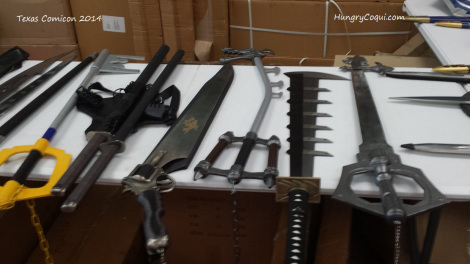 Be geeky- This doesn’t happen often, but there have been occasions when I encounter a vendor who actually knows zero about geek culture and the products they’re selling. That bugs me. Maybe that’s exclusionary, but if you aren’t at least a little bit into geek life, I feel like you’re just here to profit off of my nostalgia. I guess what I’m trying to say is, be accessible. I mean, how far did you come and drag all your wares to just stare at your phone while thousands of people walk by? I know the world tries to act like geeks aren’t a social people; but if that were true, why are conventions a thing? Yes, as a con-goer I am thrilled to see a vendor selling wall clocks made out of classic consoles. You still have to give me a reason to buy it, though. I’m curious to hear what some vendors and other con attendees have to say on this subject. 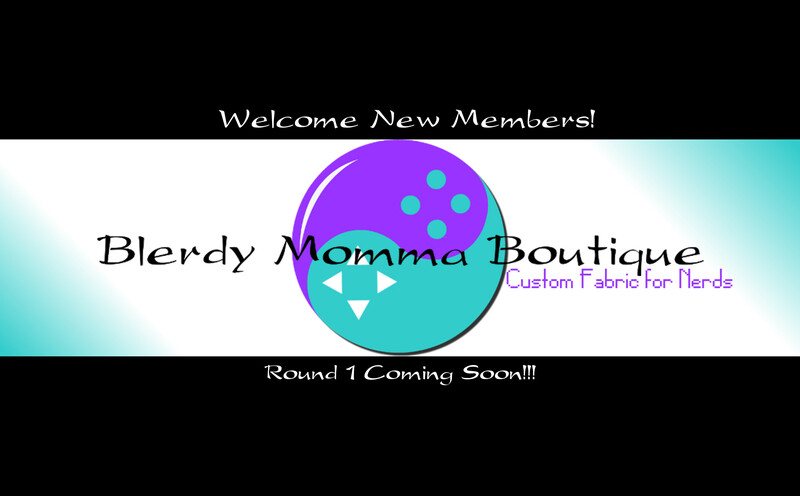 Tell Blerdy Momma what you think! Last Saturday was Free Comic Book Day! You knew that right? I had a countdown going over in the corner just in case. The family and I got up that morning and rushed on over to Alien Worlds comic book store to browse this year’s selection. Check out our spoils! *Those last two were in the store’s old Free Comic Book Day inventory. 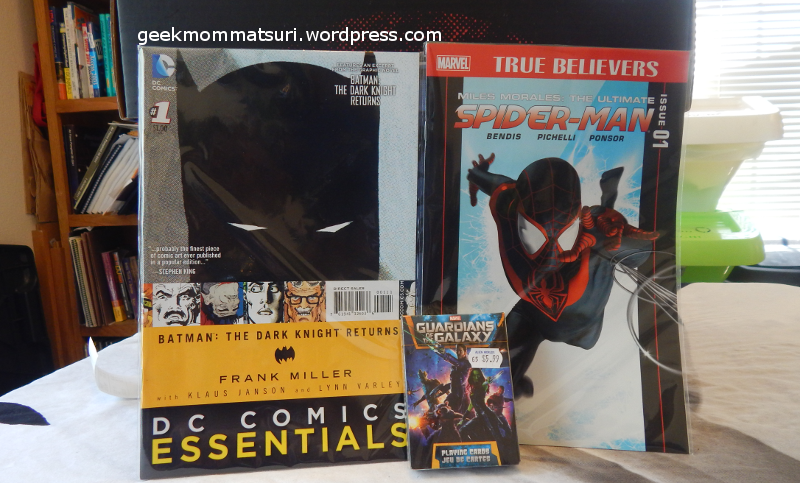 We always try to support businesses during events like FCBD, so we bought a few things while we were there too. Can I just take a moment to be proud of my 3-year-old? He comes with us every year to Free Comic Book Day but this was the first year that he really participated. He picked out his very first comic, the Sonic Sampler. 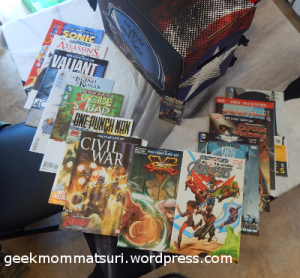 So what did you get at Free Comic Book Day this year? Let’s compare notes! Ahh… melodic dictation, the crux of what we’re doing here today. Have no fear. If you can sing it, you can dictate it. It’s time to discern the pitch of that rhythm you counted out in the last tutorial. There are tools and apps that can help you out here, but I think training your ear is key. Therefore, we’re going to use our ears and a handy dandy keyboard (or keyboard app). If you’re using notation software, it most likely plays the note through your speaker when you click on the staff. This can easily work as your keyboard. Sing the first note of your melodic line. Now play a note on your keyboard. Is it higher or lower than the note you’re singing? This gives you an indication of which direction to move (unless you hit your note dead on, in which case GO YOU!). Move higher or lower until you are matching pitch with the keyboard. Ta-da! You’ve found your first note! The hard part is officially over! Move your notation to indicate the correct pitch. Now that you have a starting point, it should get easier to find each subsequent note. Is it higher or lower than the note that came before? Maybe a short sequence of notes repeats itself. You can always default to singing each individual note and finding it on the keyboard. It goes without saying, but listen to your source recording often. Every few measures, listen to your notation and gauge your progress. Is the rhythm still accurate? Are the notes right? Did you get that accidental? Tackle your one melodic line chunk by chunk until it is complete. Congratulations! In my opinion, it only gets easier from here. So I’ve had a bit of a break away from MuseScore, and when I opened it tonight I needed a refresher course in how to get around the program. Enter Google. I came across this incredible website called MuseScoreTips!!! Whether you just need a refresher, like myself, or you’re learning the program for the first time, this site is definitely worth a bookmark! I was able to find step by step tutorials with screenshots for every function in MuseScore. MuseScoreTips – Easy-to-follow MuseScore music notation how-to articles, tips and tutorials. Where was MuseScore when I was in College? I was a music major in college. (Go Chants!) 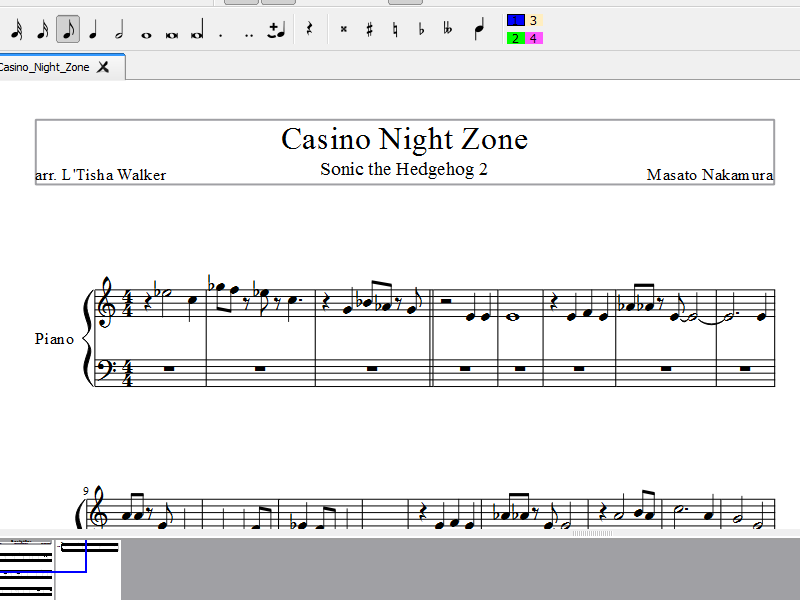 I spent a lot of time crossing my inner band nerd with my inner gaming blerd to create sheet music on my computer. At the time, everybody used either Cakewalk or Finale to do our arrangements. Both are incredible programs and are well worth the investment if you work with music on a daily basis, like a band director or a composer. I am no longer a band director, so it’s honestly not worth my money to stay up-to-date with the latest in notation software. BUT I still like to dabble from time to time. I’m 2 or 3 laptops removed from college, so I no longer have access to a legit copy of Finale. 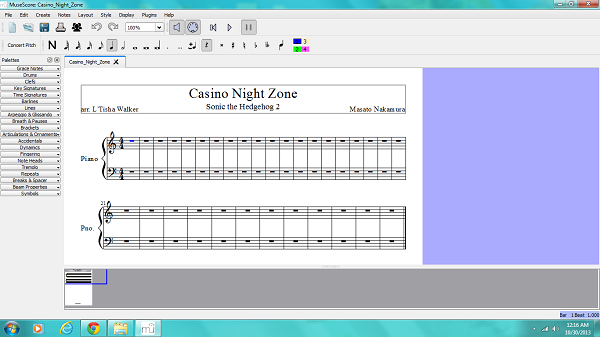 Below, you will find a link to MuseScore, the FREE notation software that I now use to make my arrangements. The learning curve may be a little steep at first, but that won’t last long. Give it a try! Maybe soon I’ll start sharing my arrangements! Update: I have now found an awesome website full of tutorials for using MuseScore. Whenever I have a question I go right over there and it’s answered. Bookmark it!